Pick up that TV and rock it, baby. While recalling a now-obsolete technology and the work of artists like Nam June Paik, de/Rastra is something of a (delightful) lie. In the form of a television, it appears to be a self-contained, vintage instrument. In reality, it’s a simulation, a CRT with “altered anatomy” that uses a computer to drive faux vintage cathode ray visualizations and to produce digital sound. But the synthesis of visuals with the body of a television is wonderful, a play on past and present technology that produces an impossible electronic now. The new soul of this ghostly machine is an Atmel 328 chip connected to various force and position sensors and buttons, communicating with a computer running Max/MSP via xBee wireless. The de/Rastra oscillographic synthesizer is a real-time audio/video instrument and computer-interfacing device that allows a performer to generate visualizations intrinsic tocathode ray tube technology while simultaneously creating the acoustic analog of the displayed imagery. By way of building, bending and mutilating, de/Rastra shows the effects of altering the anatomical makeup of a CRT television, revealing the intrinsically hidden potentials of the technology through the repurposing and restructuring of its own ability. Through hacking and exploiting the capabilities intrinsic to all CRT devices, the technology becomes repurposed as a performative interface, breaking down the device’s ‘consumption only’ nature. The performer is given control over the technology by removing it from the intended application and forcing it into an active state through a combination of physical and mental effort. The de/Rastra oscillographic synthesizer is an open source project and will eventually be accompanied by tutorials on methods of CRT hacking. Related tutorials can be found at http://www.crackedraytube.com/textstutorials.html but specific information regarding de/Rastra are in progress. Can’t get enough ray tubes? 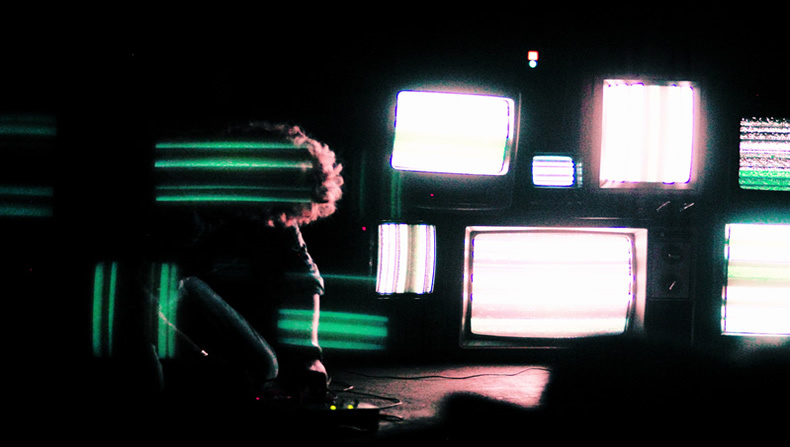 Here’s more from Kyle – Cracked Ray Tube: a collaborative performance project by James Connolly and Kyle Evans. Thanks to Martin Backes for the heads-up on this one.